Since I have been making the Camping Kitchen Box I have been using plastic ratchet rivets to hold the box together, and they have worked well, except for two of issues. First, if you really pull on them they can come apart, which was not an issues except for a couple of boxes where I used them to hold the straps for the buckles.. When I replaced rivets that held the straps with some pop rivets and fender washers and that worked great. The other issue is that occasionally the plastic rivets would break when I assembled them. This was not an issue when I caught them and replaced them, but it seemed that more and more were breaking and I was not catching them all, which caused a quality issue. I have decided that even though I liked the appearance of the plastic rivets and they were working for the most part, using pop rivets and fendor washers for all the connections made for an even more well constructed box. For those interested in the technical details, I am using 3/16 inch pop rivets. The rivets are backed up on both sides by 3/16" ID , 3/4" OD fender washers. 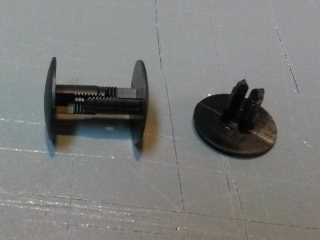 When I am attaching 2 pieces of 6MM corrugated plastic together, I use a pop rivet with a depth is 5/8 of an inch. When attaching a piece of strapping to to a single piece of 6MM corrugate, I use 1/2" depth rivets.